Here’s an excellent seed of an idea: Add seeds to your smoothies to instantly boost their health and nutritional benefits. If you remember back to your elementary biology lessons, a seed contains all the nutrients needed for the seedling to grow and develop. That’s why seeds are packed with plenty of vitamins and minerals in one tiny package. Seeds add these tiny powerhouse punches, as well as their distinctive flavors, to your smoothies. Which Seeds are the Healthiest ? These four seeds stand out for two main reasons: their fiber and their protein content. For the serving size, you can get plenty of your fiber and protein from these seeds. They give you plenty of fiber without the added gluten found in breads and added protein without the fats found in animal proteins. Pumpkin seeds can easily be found at any grocery store. The other three seeds might only be available at a natural health foods store or from online suppliers depending on where you live. Typically the best deal is found in the natural foods bulk food section where you can buy organic seeds without oil or salt added. After purchase, when you bring your seeds home, you’ll want to store them in a cool, dry cupboard away from heat or moisture which would cause the seeds to start sprouting. It’s best to keep seeds in airtight containers as well to preserve their freshness until use. Before using in smoothies, give your seeds the ‘sniff test,’ and discard any that are rancid or smell moldy or rotting. They are an organic material, so there is the possibility of breakdown. Should you soak seeds before using them in your smoothies? If so, what does soaking do? Honestly, the answer depends on the specific seed. Some seeds you can just grind up without soaking but generally the advice is to soak the seeds if you have the time. Seeds are tiny individual nutritious packets designed to survive until they’re surrounded by the proper growing conditions. Part of that survival mechanism is that seeds contain nutritional inhibitors and even toxic substances that protect the seed from the elements. Rain naturally dissolves these substances and gives the seed water to germinate. Likewise, you’ll reproduce these rain conditions by soaking your seeds. It removes the enzyme inhibitors, phytic acid, and helps make digestion easier. For whole flax seed, you can soak a tablespoon of it in water overnight. Flax seed naturally soaks up water. Soak chia seeds in almond milk or water (the ratio is ¼ cup of seeds to 1 cup of liquid) for 20 minutes until the texture becomes chewy. You can keep soaked chia seeds in the fridge for up to five days. Pumpkin seeds have phytic acid, so you do want to soak them. Cover your fresh or store-bought pumpkin seeds with 1 tablespoon of salt for every four cups of water. Let seeds sit at room temperature for 24 hours before adding to smoothies. Hemp seeds don’t need to be soaked. Personally, what I do is…. I soak Chia seeds and pumpkin seeds. I buy whole flaxseed and grind it and don’t soak it. For hemp seeds, I just buy hemp protein powder rather than deal with hemp seeds. It comes down to personal preference and time. Grind flax seed just before using to use it at its maximum potency but it is OK if you store it in the fridge for a little while. I typically grind up 1-2 cups at a time to last for the week and store the ground flaxseed in the fridge. Flax seeds have recently become popular when added to smoothies, salads, and other foods. But what exactly are they? Flax seeds are the seeds of the common flax plant, which has been grown for its fibrous properties for many centuries. Called a superfood, flax seeds are packed with Omega-3 fatty acids and lignans that help balance hormones. They are low in carbs but have a high fiber content. They have no gluten, either. One serving of 2 tablespoons contains 110 calories, 6 grams of carbs, 4 grams of protein, 8.5 grams of fat, and 6 grams of fiber. 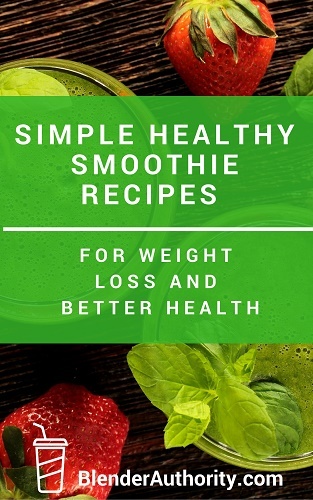 You can add 1-3 tablespoons of ground flax seeds to your daily smoothie. My favorite flaxseed is this brand which is natural and affordable. Did you ever have a Chia Pet? The same seeds you used to grow sprouts on a clay sheep are now recognized as some of the healthiest seeds in the world to eat. Called salvia hispanica, chia seeds come from Mexico and have been eaten there for thousands of years. A one ounce serving contains 137 calories, 12.3 grams of carbohydrates, 4.4 grams of protein, 8.6 grams of fat, 10.6 grams of fiber, and plenty of manganese, phosphorus, and calcium. That’s a lot of fiber! Great for keeping your digestion regular and balancing your insulin. Chia seeds are full of phenolic antioxidants, which repair your skin. Skip the candy corn at Halloween and snack on these instead. Pumpkin seeds, called pepitas, have many health benefits. A ¼ cup serving size has 150.1 calories, 13 grams of fat, 5 grams of carbohydrates, 1 gram of fiber, 7 grams of protein, and 57% of your RDA (recommended daily allowance) of iron. That’s a lot of protein and iron. Within those 13 grams of fat are plenty of monounsaturated fats, Omega-3 and Omega-6 fatty acids. They support your cardiovascular system and help reduce inflammation. Yes, hemp seeds come from the hemp plant, Cannabis sativa, long associated with cannabis. The THC (tetrahydrocannabinoids) amount is so tiny in hemp seeds that isn’t a concern. Also, hemp seeds or hemp protein that is sold at grocery stores has been tested and certified. Hemp protein is one of the best protein sources available that you body can process cleanly and is an amazing source of nutrition. A 3 tablespoon serving contains 174 calories, 13.5 grams of fat, 2 grams of carbohydrates, 1 gram of fiber, and a whopping 11 grams of protein. It also has 48% of your RDA for phosphorus, 48% of the RDA for magnesium, 23% of your RDA for zinc, 21% of the RDA for Vitamin E, and 16% of your RDA for iron. Hemp seeds give you a protein and mineral boost. -> I use this hemp protein which is good quality and inexpensive. Seeds are a great way to add healthy fat, protein, fiber, and nutrients to your everyday smoothie. They also work great mixed in with healthy nuts. We just listed some of our favorites but feel free to try other healthy seeds like sunflower seeds, sesame seeds, etcetera. Just make sure that you buy organic, unprocessed seeds which are healthier and offer a better natural nutritional profile. WebMD: Why are Hemp Seeds Good for Me? Learn about the best healthy seeds to add to your everyday diet. 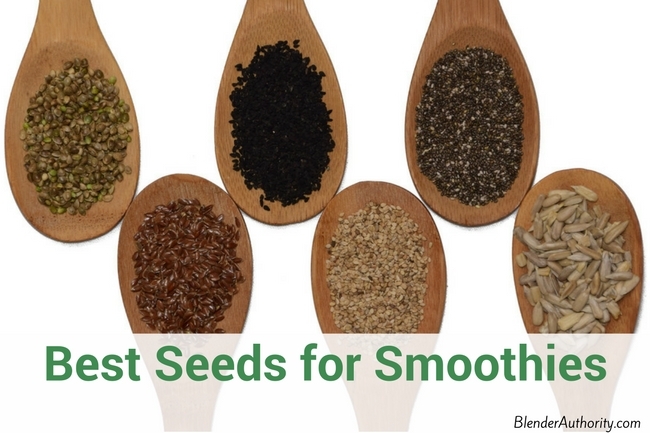 Which seeds offer the best protein, fiber, and nutritional profile for your smoothies. Can you use a tablespoon of all 4 seeds in a smoothie or is it too much fiber or protein? Hi Donna, Yes you can combine all if you like. It just might make it a little thick. Try 1-2 tablespoons of raw seeds at first for a single Nutribullet smoothie and see how you like the consistency. Then add more if you like it. You might need to add more liquid to properly blend everything if you add more seeds or nuts.